The ginseng certification program facilitates the export of American ginseng (Panax quinquefolius) while meeting the requirements of the Convention for International Trade of Endangered Species of Flora and Fauna (CITES). Ginseng is any part of the plant Panax quinquefolius. Ginseng is a potentially high value crop popularly used in herbal remedies. For the purposes of licensing and certifying ginseng for sale, ginseng may be considered either wild ginseng or cultivated ginseng. Wild ginseng is ginseng that was not planted and is growing, living or found in a natural state. No license, permit or certification will be issued in Maine for the collection of wild ginseng for the purpose of sale or distribution. In Maine, ginseng is considered state endangered. Harvesting wild ginseng is strongly discouraged because populations in the state are not large or vigorous enough to sustain harvesting, even when seeds from harvested plants are re-planted on the same site. The Maine Natural Areas Program gives ginseng a State Rarity Rank of S3 meaning ginseng has only 20-100 occurences within Maine. The plant wild sarsaparilla (Aralia nudicaulis) is a common woodland plant in Maine and is frequently confused with ginseng, leading some to believe that ginseng is much more abundant in the state than it actually is. Cultivated ginseng is any part of a ginseng plant that was planted and grown. Cultivated ginseng can be grown in prepared beds or be wild simulated ginseng, grown in a wooded site similar to where ginseng may occur naturally, but where wild ginseng is not established. In Maine a license is required to grow cultivated ginseng for sale, and certification of the harvested crop is required. Licensing is also required for dealers that buy ginseng for resale. Two types of ginseng licenses are available, a ginseng grower's license and a ginseng dealer's license. First time applicants must speak with an inspector to obtain a ginseng license application, contact the Horticulture Program or call 207-287-3891. No grower's or dealer's license will be issued in Maine for the collection of wild ginseng for the purpose of sale or distribution. Persons buying ginseng for resale must have a dealer's license. Ginseng dealer's license fees are $25. Licenses expire on December 31 of each year and must be renewed annually. Dealer's must keep records of transactions. Dealer's purchasing foreign ginseng must ensure that it is accompanied by a valid certificate issued by the state or country of origin. When ready for export the Department weighs the harvested cultivated ginseng and issues an origin certificate. The origin certificate must accompany the shipment to its final sale. The state only certifies cultivated ginseng, wild ginseng will not be certified for sale. No ginseng grown in Maine has been certified for sale since 2001. The most ginseng harvested and certified in Maine since the ginseng program was implemented in 1995 was 4.54 pounds of ginseng certified in 1998. 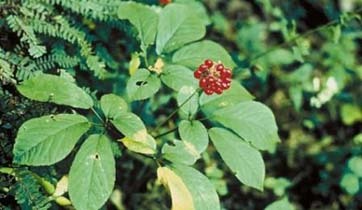 In Maine wild American ginseng is considered State Endangered. The Convention for International Trade of Endangered Species (CITES) is an international agreement that ensures the trade of certain wild plants and animals does not threaten the species survival. As an appendix 2 CITES species, American ginseng is not currently threatened with extinction, but warrants special protection because the harvest of the desirable portion of the plant (the roots) destroys the plant. Regulations have been put in place to ensure the survival of future generations of American ginseng.